Boss begins his 11th season in 2006 after having knee surgury in the middle of the 2005 season. Boss was one of eight players to earn tour exemption for the 1996 season via the 1995 Wilson Qualifying Series. A 1994 graduate of San Diego State, Boss currently sells residential Real Estate in San Clemente, CA with Distincitive Coast Properties. 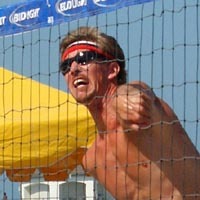 Boss started playing beach volleyball in 1985 before starting his indoor career in 1987. Boss' best career finish was winning the 2001 AVP Virginia Beach Open with Colin Smith. Boss' best finishes in 2005, 3rd with Paul Baxter and 5th with Brian Lewis.